Lakeview's Sky Castle takes takes Pub Food to a New Level! 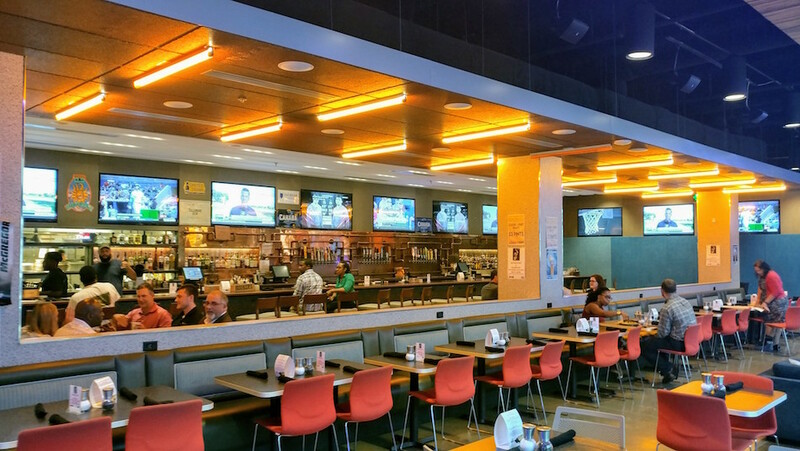 Enjoy an Expansive Selection of Food and Beer in a Trendy Atmosphere! The Lakeview District in Birmingham is full of bars, nightclubs, and pubs. With its trendy layout, massive bar, and extensive menu,Sky Castle manages to stand out among the rest. Since opening, Sky Castle has become a favorite spot for Birmingham Young Professionals looking for something other than “bar food” in Birmingham's hottest entertainment district. As you walk up to Sky Castle, the first thing you'll notice is the large patio filled with contemporary sofas and chairs that have colorful cushions. Inside you'll find even more sofas, neon lighting, and a bar that runs the length of the restaurant. 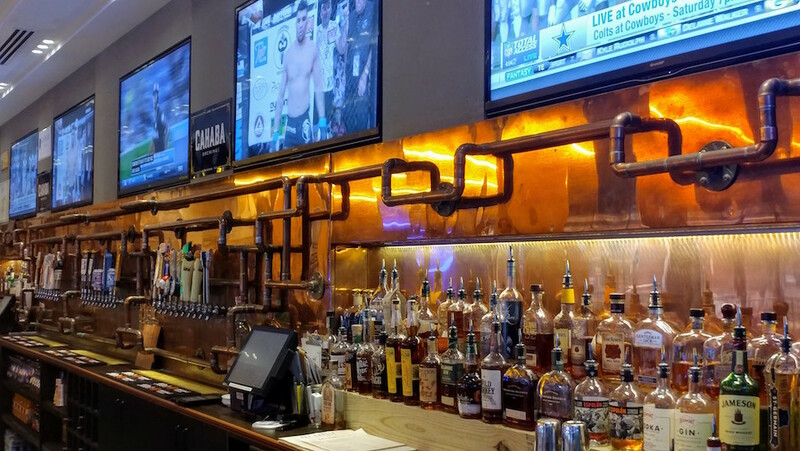 The bar is know for the wall of copper piping that holds dozens of beer taps. The atmosphere is both fun and casual. 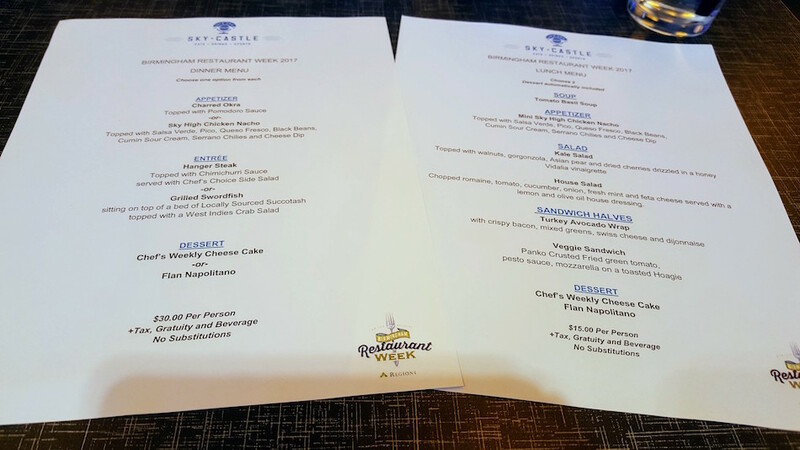 While we've eaten here before, we had never tried the Birmingham Restaurant Week menu. This year they offered both lunch and dinner options. We went in for dinner, which was set at a $30 price point and had three courses. Each course had two options, so we decided to try both. Why not, right? 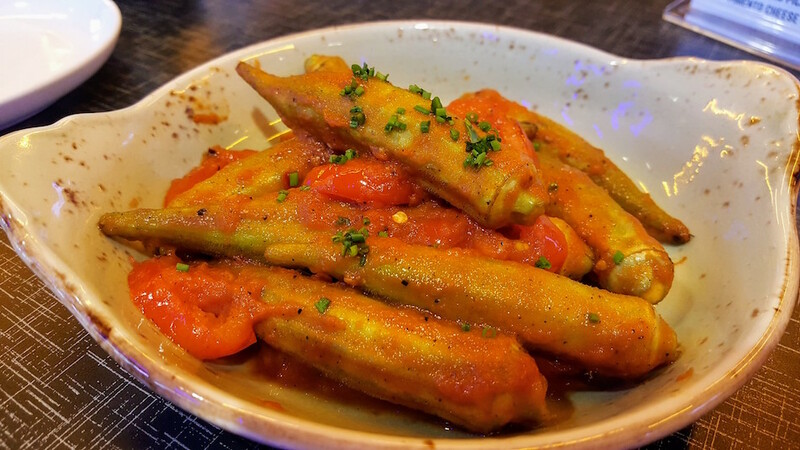 The first appetizer is Charred Okra, that comes topped with Pomodoro Sauce. The okra is served warm and whole. The sauce has a tomato flavor and a hint of spice. There's plenty of okra to share with friends! The other appetizer is the Sky High Chicken Nachos. This is one of those appetizers that could easily be ordered as a meal. 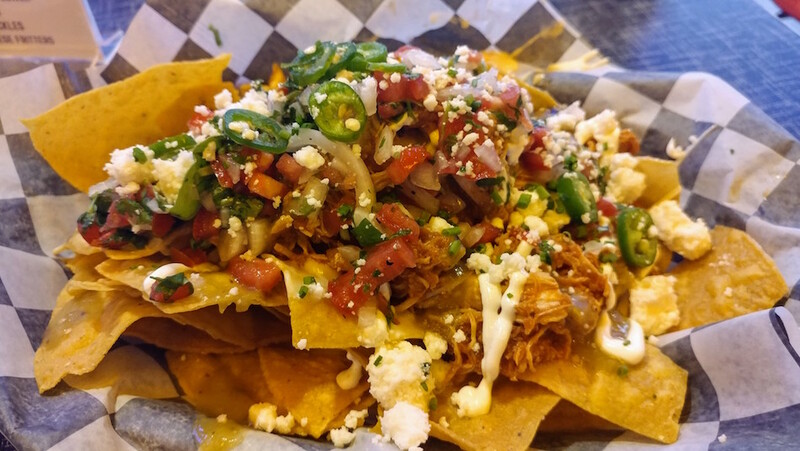 The chips come piled high with tender shredded chicken, salsa, queso fresco, black beans, cumin sour cream, serrano chilies, and cheese dip! Yep, all of that and it's still considered an appetizer! I guess they want you to share, but you probably won't want to. For the fist main dish we had the Hangar Steak. 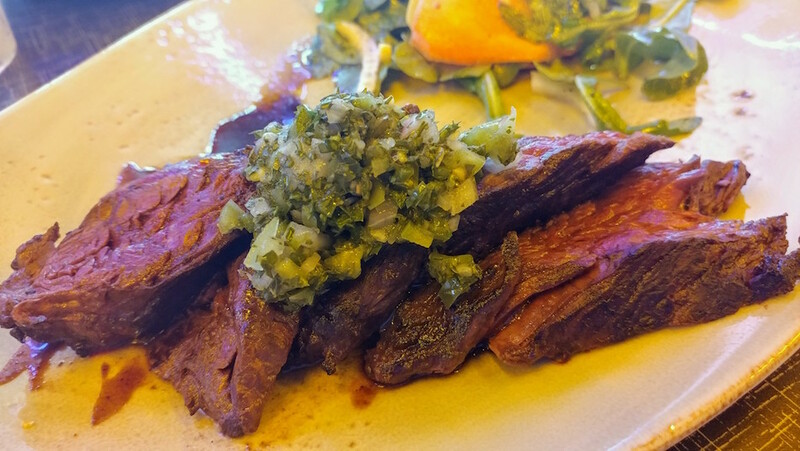 This steak is sliced thin and topped with a flavorful chimichurri sauce. It comes with a side salad as well. The salad was fresh and, since I stuffed myself with the nachos, I had plenty of steak leftover to take home. Pro Tip: This makes for great steak biscuits at breakfast! The next dish was Grilled Swordfish. We were surprised at how big the piece of fish was! It was pretty massive. 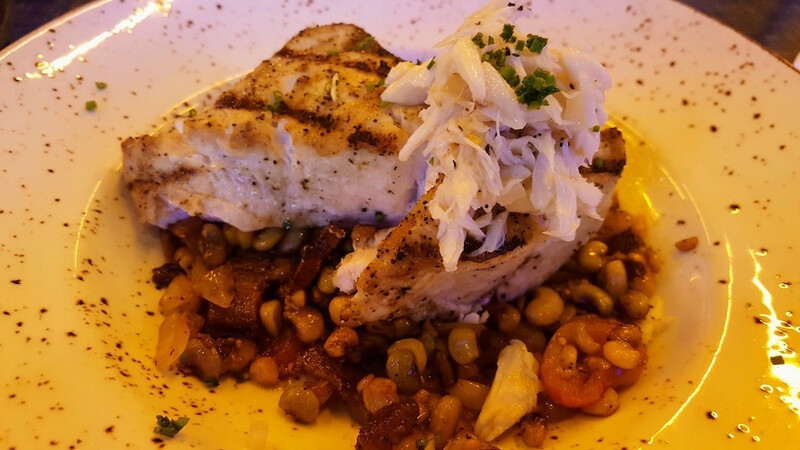 While we are fans of swordfish, the succotash it came served on stole the show! The succotash was made with locally source veggies and was bursting with fresh flavors! All of this comes topped with West Indies Crab Salad. We had plenty left to take home with us. For dessert we first tried the Flan Napolitano. 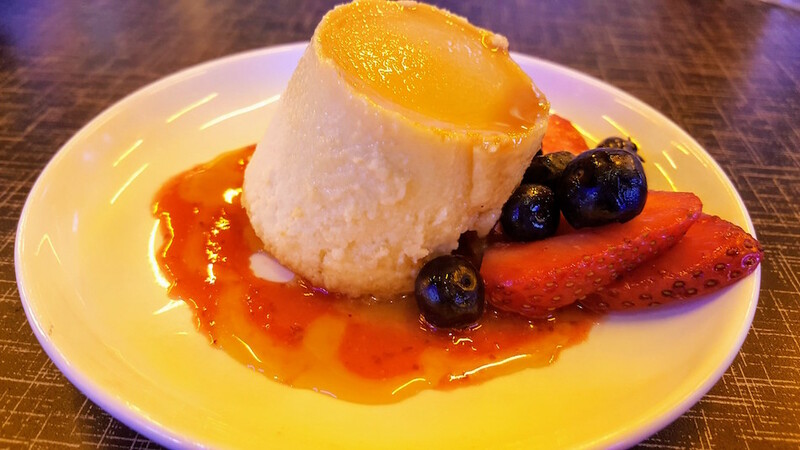 This Flan is served chilled and is both rich and dense. The second dessert was the Chef's Weekly Cheesecake. When we went it featured strawberries and blue berries along with a fruit drizzle. 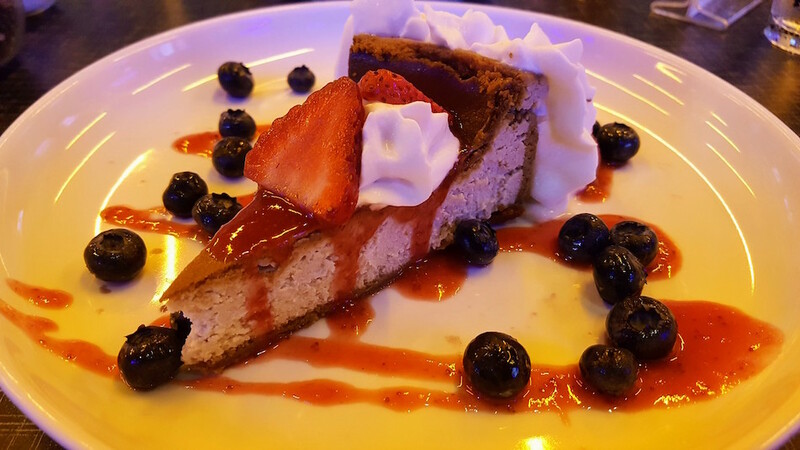 The cheesecake was soft and the crunchy graham crust added the perfect amount of texture. It was a pretty big slice, so you may want to share! If you are looking for a fun, energetic, atmosphere that serves up food that is far from typical bar fare, be sure to stop in and try Sky Castle! The drink selection is more than impressive and they also have plenty of tv's showing your favorite sporting events! Sky Castle continues to be a welcome addition to Lakeview! Galley and Garden Boasts an Elegant Lunch You Don't Want to Miss!